The Canadian government has confirmed that BAE Systems has been awarded the contract to provide 15 Canadian Surface Combatant (CSC) vessels based on the BAE Type 26 Global Combat Ship. BAE Systems, along with CAE, L3 Technologies, MDA and Ultra Electronics, has partnered with lead-contractor Lockheed Martin Canada as part of a successful offering to the Royal Canadian Navy of one of the most advanced and modern anti-submarine warships in the world. Lockheed Martin Canada, in partnership with BAE Systems and Irving Shipbuilding, the CSC program prime contractor, will be responsible for delivering 15 ships, all built at the Irving Shipbuilding Halifax shipyard. Andrew Wolstenholme, group managing director, BAE Systems Maritime and Land UK, welcomed the announcement, saying, "The selection of the Type 26 design for the Canadian Surface Combatant reinforces its position as one of the world’s most advanced anti-submarine warships and showcases the strength of British innovation on the global stage." The program will benefit from advanced digital design techniques and builds on the Royal Navy’s pedigree in anti-submarine warfare and extensive operational experience. Canadia's CSC variant of the Type 26 Global Combat Ship is based on the Royal Navy's future-HMS Glasgow, the lead-ship of the class, which is currently under construction for the RN at BAE Systems’ shipyard in Glasgow, and will be equipped with high-tech platform innovations from prominent Canadian companies. UK International Trade Secretary, Dr Liam Fox, said, "The announcement will bring further prosperity to both nations and is another demonstration of the success of BAE Systems’ Type 26 Global Combat Ship design, after it was recently chosen as the winning design for a contract with the Royal Australian Navy." The CSC project is the largest, most complex procurement ever undertaken by the government of Canada. 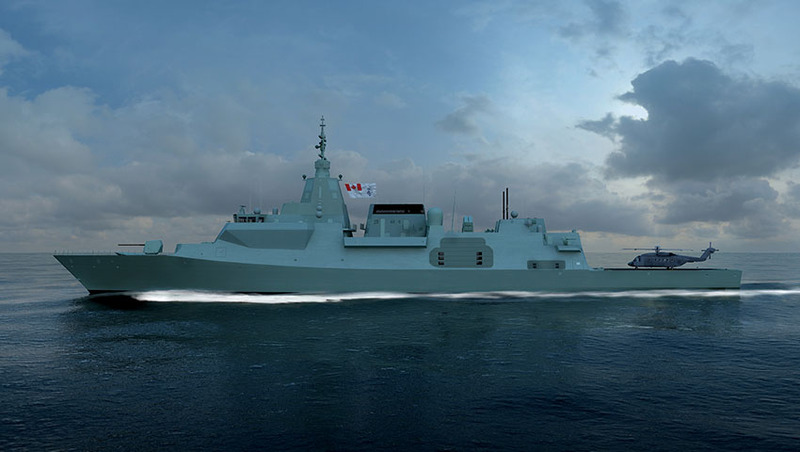 These ships will form the backbone of the Royal Canadian Navy and will be Canada’s major surface component of maritime combat power for decades to come, with construction expected to commence in the early 2020s. Canada's fleet of future surface combatants will replace the Iroquois and Halifax Class warships and provide wide-area air defence, anti-submarine warfare and anti-shipping capability. BAE Systems Australia Hunter Class frigate program managing director Nigel Stewart welcomed the Canadian announcement, saying, "This announcement is great news for the Canadian team and I congratulate them on the success. The decision to base the new frigates on the Type 26 platform is fantastic news for the Hunter Class Frigate Program." "With the UK, Australia and Canada part of the Global Combat Ship family, it will create significant opportunities for the sharing of data and can only help support the delivery of the Australian program." The Type 26 Global Combat Ship serves as the base design for the RAN's Hunter Class frigates. The $35 billion SEA 5000 Hunter Class frigate program will see Australia's eight Anzac Class frigates replaced with nine Hunter Class vessels, to be built by BAE Systems at Osborne Shipyard in South Australia from 2020. The project is expected to create 4,000 jobs. In October 2018, BAE Systems Australia announced that it had signed an advanced work arrangement (AWA) with the Australian government for the Hunter Class frigate program. The AWA allows BAE Systems to continue to mobilise the program, including maturing design and engineering plans, establishing a skilled workforce and setting up the required infrastructure necessary to commence prototyping in 2020.